Marvel vs. Capcom: Infinite showed up to today’s release party with a lopsided character select screen. Infinite’s latest update bolstered the playable cast to include Winter Soldier, Black Widow, and Venom earlier today. They join previous fighters Black Panther, Sigma, and Monster Hunter to comprise the game’s first roster expansion. Those familiar with the two universes may have already noticed a disparity here: instead of an equal amount of characters for each side, Infinite received four Marvel characters to Capcom’s two. 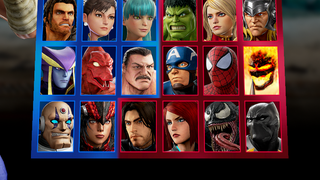 This completely screws up the game’s character select screen, causing Winter Soldier to encroach on the blue-tinted space that signifies the Capcom side of the roster. It’s a complete eyesore. Infinite is already considered an ugly game. Before its official launch in September, its generic aesthetics were compared to something you might see on mobile platforms. Where its predecessors totally embraced Marvel’s comic book origins, Infinite fails to establish a solid visual identity. It’s probably safe to assume the roster will be evened out with the next crop of character releases, and a sloppy character select screen doesn’t harm gameplay. But the lack of even trying to get something this easy right is telling.